What is the first thing you usually do in the morning? Heading to the bathroom? Grabbing a cereal bowl? Or getting your coffee maker ready? All these sound like a practical morning routine, yet I would like to offer you another smart alternative: "Wake Up Yoga!" I don't teach yoga for a living, so please don't address me as "Guru Om." You may call me a yoga freak, though. I have been in love with yoga for quite a few years, participated in various types of yoga courses and further deepened my knowledge of this invigorating exercise from a number of insightful books. This morning yoga routine is a quick workout plan I have put together, originally just for myself. I would rather attend a full hour of yoga class instead of doing this short yoga routine at home, of course, but sometimes my schedule just won't allow that. Ten to fifteen minutes of yoga in bed is better than no exercise at all. This morning yoga routine aims to nurture your overall wellness, prepare your mind for a long day of work and stress, as well as make your whole body feel great and energized. If you are looking for a way to lose weight, this yoga program could help but might not be enough. Honestly, I think you would need a more strenuous workout than this in order to shed some extra pounds. So you may include this routine in your weight loss strategy but don't rely solely on it. All the hatha yoga poses in this routine are pretty simple, thus beginners should be able to perform them safely with no supervision from a professional. However, if you have previous bone injuries, it's important for you to take a cautious step; discuss this yoga program with your doctor first. Start with putting all the pillows, bolsters and comforters aside. If you feel more comfortable with something beneath you head, use a flat pillow or a folded thin blanket. Your head should not be much higher than your body in the prostrate position. Hug your knees to your chest. Slowly move them from side to side, then move them in circle a few times in both directions. Try to synchronize your breathing with your movement. For example, inhale as you rotate your knees to the left, then exhale as you rotate them back to the right. Let each inhalation and exhalation be long, smooth and complete. This should be more like a meditative movement rather than just a regular warm-up. Besides preparing your body for the workout, it can also calm your mind and improve your focus. Bring your knees back to center. Stretch your arms out in the T position. Inhale deeply, and as you slowly exhale, shift your knees to the right until the side of your right leg reaches the mattress. Continue to breathe slowly. Keep your knees in line with the hips. Try not to let your left shoulder lift up from the mattress. Turn your head to the left and stay in this pose for about a minute. Once again, bring your knees back to center and repeat the pose on the opposite side. Benefits: This yoga pose has proven to relieve back pain, sciatica and discomfort in the hips. Plus, it can invigorate the spine, improve digestive system and promote kidney function. Place both your feet on the mattress. Lift up both legs, keeping your knees bent and in line with the hips. Your shins should make a 90-degree angle with your thighs. Place a small bolster between your thighs. In case you don't have one, just roll up a small blanket or towel. 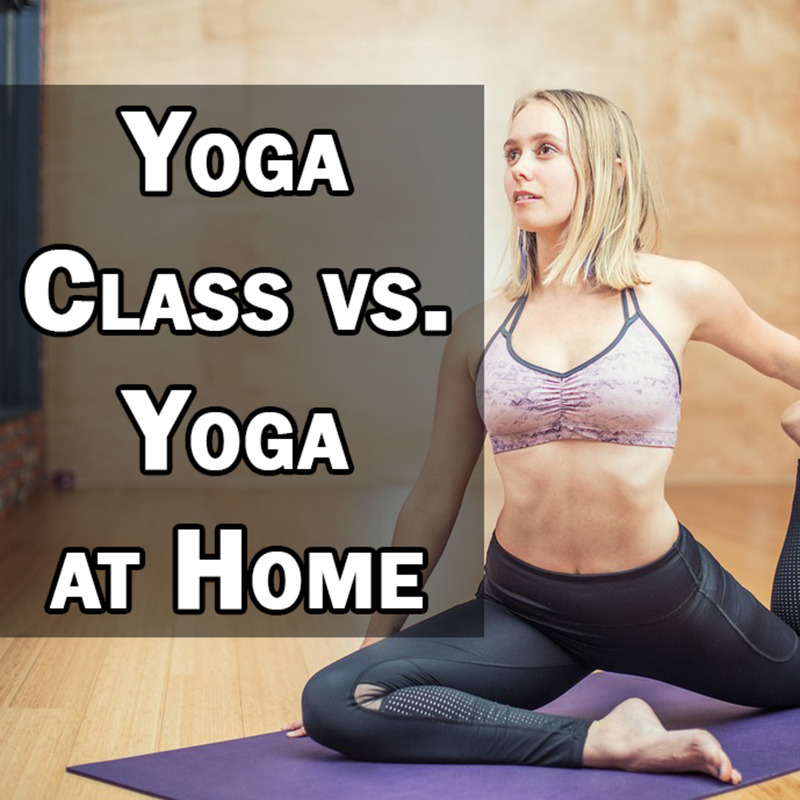 (If you want to practice yoga at home, you need to be creative and know how to improvise!) Place your palms beneath the back of your head and interlace your fingers. Inhale slowly and deeply. As you exhale, lift your head up from the mattress. Don't try to bring your chin to your chest. Instead, just try to lift your head straight up. This way you won't strain your neck. At the same time, squeeze the bolster tightly with your thighs. Stay in this pose for 3 - 5 seconds, inhale and release. Repeat this 10 times or more if you are inspired to do so. Benefits: This pose not only strengthens the thighs and abdominal muscles, but can also relieve stress and improve the digestive system. Yoga practitioners believe the abdominal area is where our manipura chakra is located. Too much energy trapped in this chakra may lead to a decreased sense of well-being. A daily core workout can unlock this chakra, and help us regain our ability to experience simple joy and find satisfaction in everyday life. Stretch out your legs and keep them about hip-width apart. Lift up your right leg, then grab your calf with both hands. If you can't reach the calf, you may hold your thigh instead. Also, you can either keep the leg straight or bend it slightly. Spread your toes apart a few times. Point your toes at the ceiling, then point them at the wall behind your head. Repeat these alternate movements 6 - 8 times. Then circle your ankle slowly in both directions a few times or until you're satisfied. As your ankle and foot are doing all these moves, try to keep your upper body completely relaxed. Grab a scarf or belt, and place the middle part of it on your sole, right next to the ball of your foot. Hold the ends of the scarf with both hands, then try to pull your leg back as close to your head as possible and stay in this pose for a few long breaths. Do this very slowly. Don't force yourself to go beyond your physical limitation. Now hold the ends of the scarf with only your right hand while stretching out your left arm sideways. Slowly move your leg as far to the right as you can without lifting your left hip from the mattress. 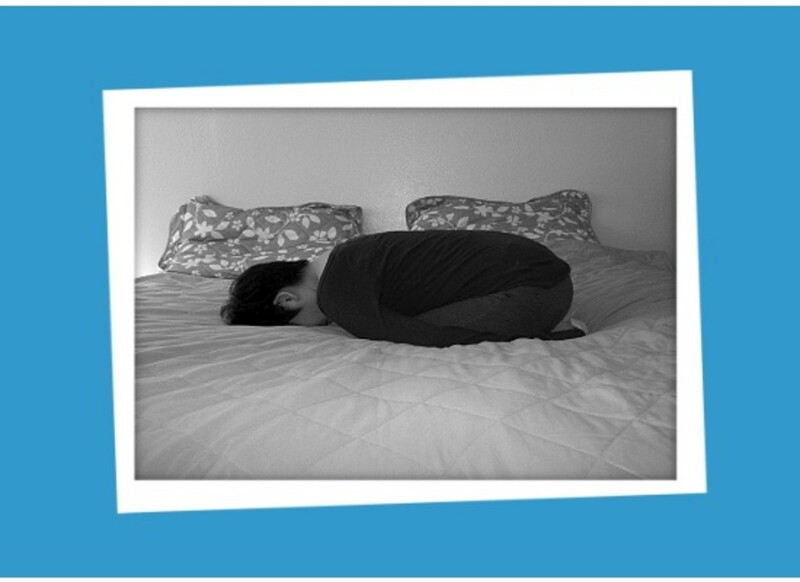 Stay in this position for 4 - 6 long breaths. Use your left arm to help anchor the left side of your body down. Bring your right leg back to the neutral position. Transfer the ends of the scarf to your left hands, then stretch out your right arm sideways. Slowly tip your right leg to the left until it reaches the mattress. Allow your right hip to lift up but keep your right shoulder down. Turn your head to the right. Stay in this twist for 4 - 6 long breaths. Bring the leg back to the neutral position, release and repeat the whole process with your left leg. 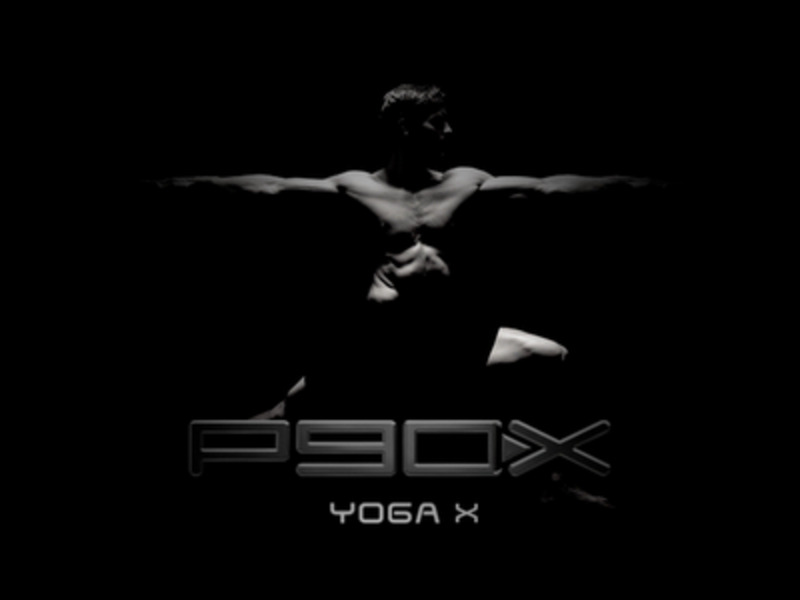 Benefits: This whole series of leg stretching is great for your foot joints, hamstrings, hips and all the leg muscles. It is something you should do in the morning because it promotes the sense of agility and flexibility. To get your body going, first you need to wake up your legs! Push yourself up to a seated position. You can either sit cross-legged, or sit on your shins with your knees together and your bottom on your heels. Choose whichever is more comfortable for you. Stretch out both arms in front of you. Cross your right arm over your left and bend your elbows. Make a 90-degree angle, with your right elbow resting in the crook of your left arm. Intertwine your hands with each other until your palms touch. If that is not doable for you, don't worry. Just do the best you can. Your upper arms should be about the same height as your shoulders. Try to sit up very straight; don't slouch or lean to one side. Stay in this position for about 30 seconds to a minute. Release and redo the pose with your left arm on top of your right. Benefits: This yoga pose might look a bit funky, but it allows you to stretch your shoulders, arms and upper back in such a soothing way. 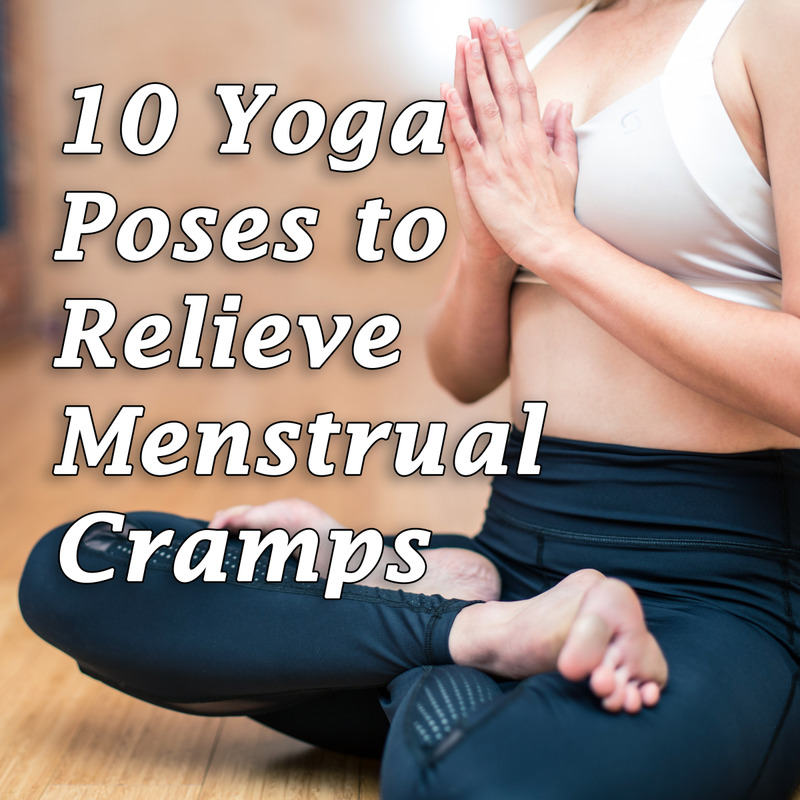 Plus, it helps stimulate more blood circulation to the upper body. If your job requires you to sit in front of a computer all day, your back muscles can become very tight. With this yoga pose, you can release all that tension and have a fresh morning start. Now get on all fours. It's time for "cat and cow." Your hands should be right under the shoulders, and your knees right under the hips. Keep your spine in the neutral position and take a few deep breaths. To move into the cat pose, round your back as you make a long, slow exhalation. As your back is slowly rounding, drop your tailbone and tuck your chin toward your chest. Stay in this posture for about 3 - 5 seconds. Start to inhale again and gradually arch your back in order to switch to the cow pose. Raise your tailbone and lift your chin slightly. Stay in the pose for another 3 - 5 seconds, then move back to the cat pose. Complete about 10 rounds of "cat and cow" before returning to the neutral position. 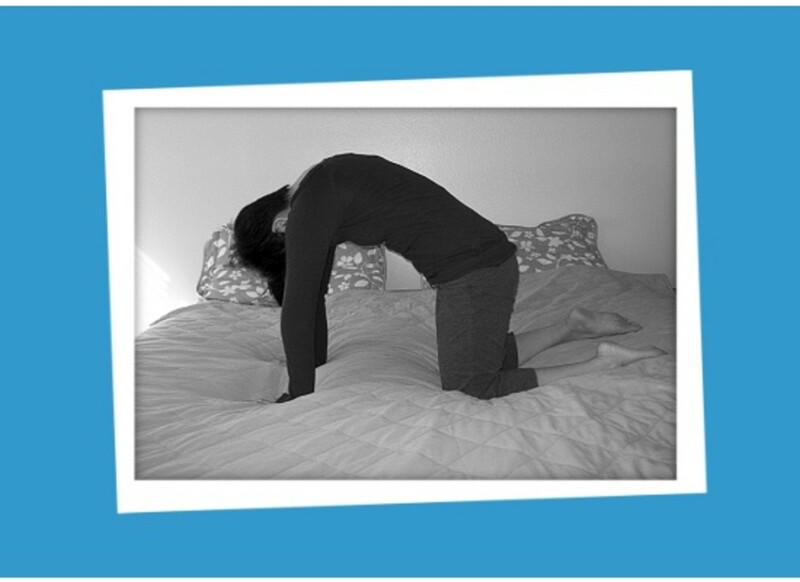 Benefits: "Cat and Cow" is a gentle exercise for your spine and neck. On the psychological level, it ushers your mind into a state of calmness and gets you ready for any stressful issues that might be lingering at your workplace. Sit back on your heels. Your knees can be either together or hip-width apart. Bend forward and rest your forehead on the mattress. If your bottom can't reach your heels, place a folded blanket or pillow between your bottom and heels for support. Let your arms rest on the mattress, alongside your torso. Observe your breathing and the movement of your stomach as you inhale and exhale. Stay in this pose for about 1 - 2 minute. Find that inner peace but don't get too comfortable, or else you might fall back asleep! Benefits: The child's pose can give the hips, back and thighs a pretty good stretch. More importantly, it is a symbolic posture of openness and humility. Being in the fetus position once again, you should try to feel the connection to infinite possibilities you once experienced as a carefree child. Whatever life might bring you for the day, receive it courageously and humbly. That's the end of my morning yoga routine. I hope you will give it a try to share it with your loved ones. Namaste. What do you like about yoga? It's an effective way to stay healthy and control weight. The poses are fun to do. I like its mind-calming effects. Not sure. I haven't tried yoga yet. I just loved your hub. I am glad I do most of these asanas in the morning before leaving bed and also the alternate leg raise. 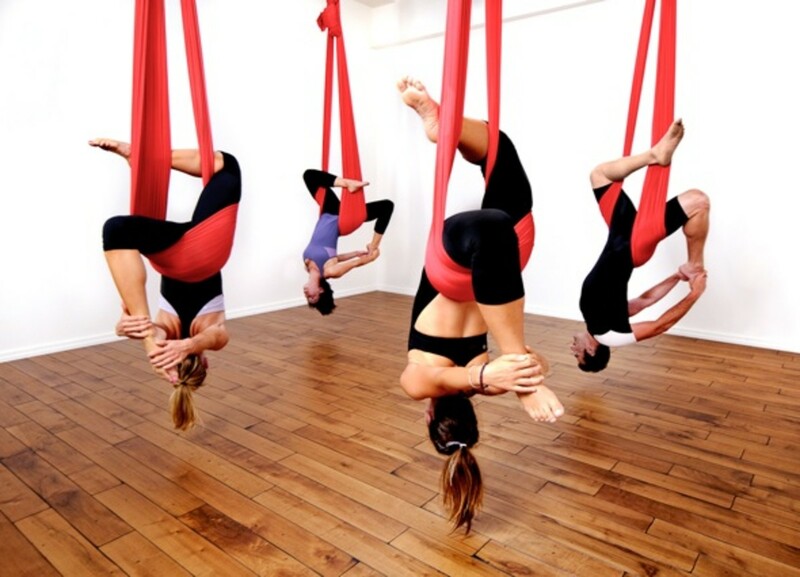 These definitely make our body more flexible after that. Thank you for sharing with others. Thanks! Om, congrats on HOTD! What a great idea. After a six month break from gym and home practice, I'll be hitting the gym real soon and resume home practice. I might give morning yoga a try, this spring. Thanks for sharing your tips! Thanks for dropping by, SamitaJassi. Glad you like this morning yoga routine! Most of the poses are a bit feminine, but I'd definitely give it a shot! Thanks for these suggestions! @Gratitude Journal - You're very welcome. Thanks a lot for dropping by. What a nice way to wake up in the morning and feel invigorated and fresh. 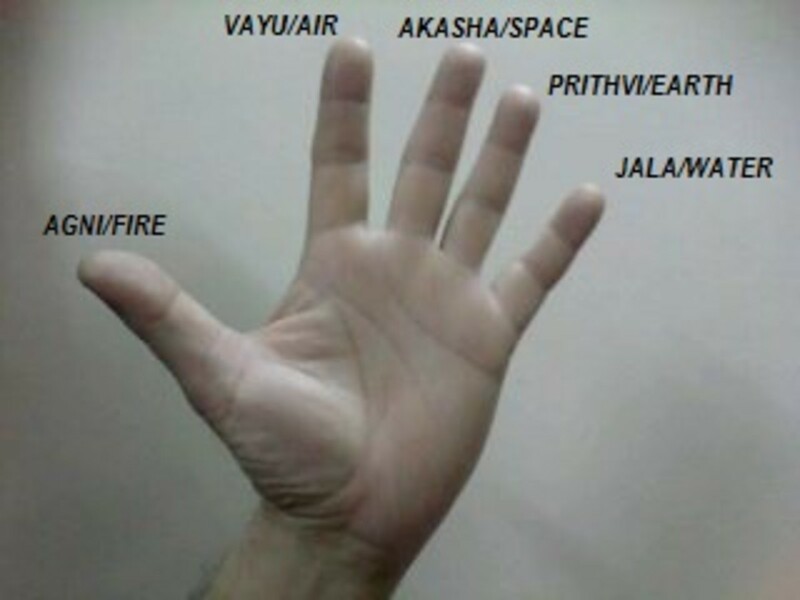 Thanks for these asanas and the great pics to describe them. Oh this looks like a good way to start getting into yoga for a beginner. I would love to take it up but tend not to have enough drive to just do it! And no time for a class. Not sure the hubby would be to please if I boot him out of bed for it though! lol! @rajan jolly - Thanks for your comments and votes! Glad you enjoyed the hub. Om, this is a novel way to get the system to revv up roght from the word go. Nice photos complement the hub. @ LA Elsen - Yep, this is a good yoga routine for a beginner. I hope you and your husband enjoy doing yoga together. @MarleneB - Thanks for your kind words, Marlene. Hope you give this morning yoga routine a try sometime. This sounds so invigorating. What a great way to start the day - get the blood flowing before you even get out of bed. Great pictures and explanations. I totally stumbled upon your hub at the right time. My husband has FINALLY agreed to start yoga with me and this is just the ticket. Thanks so much for the great hub Om! Thanks, Pinkchic18. Glad you find this wake-up yoga routine interesting! Workout from bed? That's my kind of workout. I'll have to try these, I love yoga! Thank you, Rufus. Glad you like this morning yoga routine! I like to practice mindfulness exercises in the morning - this is a great way to combine physical and mental exercises as part of my morning routine. Great hub! Great post, I have been practicing yoga for the past 3 years, and morning yoga is one of the best ways to start the day. Cheers! Just wanted to let you know I just shared this link on a blog post about a woman who was having some back problems... told her I couldn't guarantee anything, but it's been doing wonders for me!! Wow, interesting. I will try these movements. This. Is. Awesome. I think I've said it before but, You never cease to disappoint. I think I'm going to have my laptop bedside, so I can wake up and use this hub as reference! Up, Useful, Awesome! Thanks! @Carlon - Hi, Carlon. I'm glad you like doing yoga. Hope your back has completely recovered now. @DRG - Yep. Wake up yoga is easy and fun, a great routine for beginners. Great Hub. I recently started doing yoga and this is a great way to do it. I've done all these positions and they do release energy to the body and give great flexibility. It's nice to have a name put to these moves. I've learned them over the years through various exercise videos and when I had to go through therapy for back injury. Smile! I have done Yoga a few times while my sister is crazy about it. This yoga in bed might interest her as it's almost like she can't live without yoga! I recently started doing crunches in bed because it feels better on my spine. Thx for sharing, I'm going to incorporate this into my routine! Great exercise routine, I will take note. I haven't tried doing yoga in bed, I think it is interesting! Thank You! This is the best idea in the world! Great and useful idea to start well the day! Thanks for wrote this page! I love Yoga & Your Yoga Hubs..
Now there's no reason not to stretch in the morning. great hub. These look great. I think I will try them. As I had my body all twisted around to paint the walls around the commode in our guest bathroom today...I could have used a bit more flexibility. Wasn't a pretty sight! Haha! May try some of these poses in bed tomorrow! Great photos and descriptions. Congrats on your win! @akirchner - Don't let Bob get in your way. Instead, maybe you should convince him to try this yoga routine with you. I took my bf to my yoga class a couple times but he doesn't want to do it anymore. His excuse was "my body can't move like that!" Good hub. I like yoga, too, and have been doing it on and off for many years. I should be more consistent with practicing it, and this hub is an inspiration. Super hub, Om~! And congrats on the win - well deserved with such fantastic text and great photos!! I think I could do that, too - except Bob might get in my way. I'll have to try it on my days off when I get to sleep in and have the bed all to myself for a while!! No excuses then? Great inspiration to get in shape without even leaving the bed. Love your glitzy illustrations and congratulations on your win. I saw your hub shortly after you published it and I was like, "That one is going to win"
awesome and productive way to wake up in the morning! Are there any Nighttime poses before bed that would be great for relaxing? I would love to hear if you know of any. Congratulations on winning the writing contest, this hub truly deserves the award! I love the way you used black and white photographs on the blue mat to illustrate the positions -- it's very artistic and professional looking. Reading this made me want to try doing yoga again after a lapse of many years. Great hub! Totally cool hub--one worthy of bookmarking. Love your pictures-they are always helpful in lieu of trying to visualize. Rated 5 stars!! Congrats too! The photos are really helpful when writing about yoga. I'm adding myself as a fan. Congrats on winning the Writing contest. I have been doing some of those stretches but I see I need to add a few more on to the morning routine. This is an excellent hub with great instructions. I just noticed the comment above and congratulations are in order. Well deserved. Om, it makes sense to me to start the day this way. I find that any exercise is best done in the morning. Aaaaand congrats Om Paramapoonya!! This Hub won Staff Pick for Day 11 in the So You Think You Can Write Online contest!! This is SUCH an awesome Hub, Om Paramapoonya. I love doing Pilates in the mornings- I almost literally roll out of bed and onto my mat- but now I can get some yoga in before even leave my comfy mattress! These moves are great, your photos perfectly illustrate them, and the table is super helpful! Love the poll at the end, too. Voted up and awesome! You have me pegged! Up early, 4-6 fur-angels all in need of attention and feeding and walking, and the coffee pot plugged in! Having done that however, I am pretty good at beginning my yoga routine before anything else gets in the way! Early morning yoga, just as the sun is rising, with soft music, contented pets and a heart full of gratitude is just the best! Thank you for reminding us that the bed makes a fine yoga mat! There are some chilly mornings and stiff joints that will appreciate the softness! GREAT Hub! GREAT photos! Thank you! Om, it's a great idea, I wish I could but I'm afraid something or somebody will need my attention. I'm making a promise to my self to start doing these in the morning.